My name is Savannah and this is my cat Cupcake. Her favourite food is: My cat’s favourite food is Special Delights- Indoor Formula. My cat enjoys looking out our patio door. One strange habit my cat has is she won’t go to the bathroom unless someone is in there with her. I don’t know how she got that habit- but she has it now. I got my cat from a friend who needed to give up her cat's kittens. My cat has a similar habit to your cat his bathroom issue. My cat won’t eat his food unless I go in the kitchen with him. I see him sitting there in front of his filled food bowl just staring at it. As soon as I go in there with him, he will start to eat. It’s as if he is waiting for permission to eat. but in reality its probably because he feels safer. When a cats head is down eating or in the litter tray they are vulnerable to attack, or at least they would be in the wild. With us there we can keep guard. 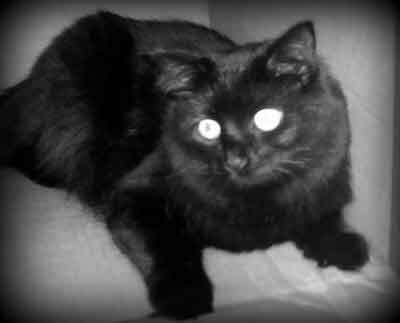 Nice black and white photo of your cat, it really shows off his silky black fur and shining eyes. I used to be a pet photographer and cats were the hardest to capture. they always moved at the last minute and it was difficult to get their fur and texture to show up well. I used to spend hours sitting around waiting for the right moment but it was always worth it in the end. I got some stunning shots. Love the smudge on her nose. Like the name too, does she come to the name or do you have to abbreviate it to something like cup, cuppy, cake? My cat is very special to me because she is like my baby and is always making me happy with the little things she does. 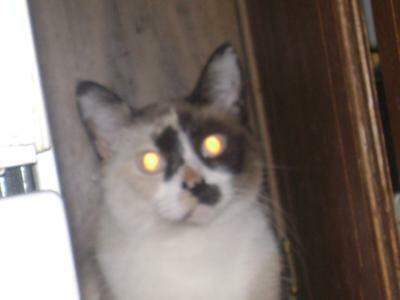 For example, she was in a box thinking she was invisible and would paw at you when you would pass her. She knows when you aren't feeling good and will usually stay by your side when you're sad. She is smart and had found many places to go to get her black fur all dusty for me to clean for her.